Jules Blackham is a Consultant in Emergency Medicine at the regional Major Trauma Centre at Southmead Hospital in Bristol. He graduated from Bristol University in 2002, and trained initially in anaesthesia and then Emergency Medicine. He has worked for Great Western Air Ambulance team since its initial formation in 2007 and flies regular with the service. He is medical director for Run Bristol (Bristol 10K and Half Marathons) and is a crowd doctor for Bristol City and Bristol Rugby clubs. 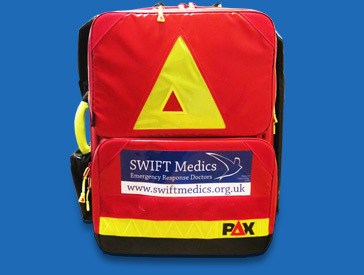 In 2015 he joined SWIFT Medics and responds from the Bradley Stoke area of North Bristol. Scott Grier is a trainee in Anaesthesia, Intensive Care Medicine and Pre-Hospital Emergency Medicine in Bristol. He graduated from Imperial College School of Medicine in London in 2007 and moved to the South West in 2009. Scott’s interest in pre-hospital care began at medical school. He joined Great Western Air Ambulance as a volunteer doctor in 2013, completed his Pre-Hospital Emergency Medicine training with them in 2015 and joined SWIFT Medics in the same year, responding from Yate. Phil Cowburn is a Consultant in Emergency Medicine at Bristol Royal Infirmary, Medical Director of Great Western Air Ambulance, a Trauma Team Leader at Southmead Hospital and the Associate Medical Director (Acute Care) of South Western Ambulance Service. Owen Hammett is a Critical Care Technologist at the University Hospital Southampton NHS Foundation Trust. He has a passion for medical education and co-founded the Wessex Inter-professional Critical Care Programme, which brings together medical, nursing, paramedic students as well as other healthcare professionals to develop undergraduate education within the critical care domain. Owen's nursing background includes emergency care and simulation, specifically in paediatrics, prehospital emergency medicine and trauma. He is currently the education facilitator for the Dorset and Somerset Air Ambulance. Phil Hyde is a Consultant Paediatric Intensivist at Southampton Children’s Hospital, Medical Lead for Dorset and Somerset Air Ambulance and curriculum chair of the Intercollegiate Board for Training in Pre-Hospital Emergency Medicine (IBTPHEM). He has an interest in team education. Phil Lucas is a GP who qualified in medicine from the University of Bristol in 2009, whilst concurrently also qualifying as a Paramedic. He has 15 years of experience working in pre-hospital care, initially as a first-responder and latterly as a BASICS doctor for SWIFT Medics. Tim Nicholson-Roberts is an Army Consultant in Anaesthesia and Neurosciences Intensive Care at University Hospital Southampton and a Doctor flying with Hampshire and Isle of Wight Air Ambulance. In a deployed role he has served in Sierra Leone during the recent Ebola epidemic, in Iraq and on the MERT in Afghanistan. Tim has a strong interest in medical toxicology and is currently researching medical countermeasures to toxic lung injury with the Defence Science and Technology Laboratory and the University of Southampton. Jerry Nolan is a consultant in anaesthesia and intensive care medicine at the Royal United Hospital, Bath, UK and Honorary Professor of Resuscitation Medicine at the University of Bristol, UK. He trained at Bristol Medical School and undertook anaesthesia and critical care training in the UK in Plymouth, Bristol, Bath and Southampton, and at the Shock Trauma Center, Baltimore in the United States. Jerry is Editor-in-Chief of the journal Resuscitation and Chairman of the UK National Cardiac Arrest Audit Steering Group. Jerry is Vice-Chairman of the European Resuscitation Council (ERC), the immediate past Co-chairman of the International Liaison Committee on Resuscitation (ILCOR) and co-editor for the 2015 International Consensus on CPR Science with Treatment Recommendations. Jerry is an elected member of Council of the Royal College of Anaesthetists and his research interests are in cardiopulmonary resuscitation, airway management, and post-cardiac arrest treatment. Matthew Thomas is an Intensive Care Consultant at Bristol Royal Infirmary, the Severn Deanery Training Program Director for Pre-Hospital Emergency Medicine, Lead Consultant on the Great Western Air Ambulance and an examiner for the Diploma in Immediate Medical Care. Matthew has a special interest in resuscitation and post-resuscitation care, having published widely in the field and is on the Study Management Group for the Airways 2 trial. James Tooley is a Critical Care Doctor with SWIFT Medics and the Great Western Air Ambulance Charity. He has been a Consultant in Paediatrics and Neonatal intensive care for more than 10 years and is a full time retrieval consultant and clincal lead for the NEST (Neonatal Emergency Stabilisation and Transfer) team based in Bristol which covers Gloucestershire, Somerset, Wiltshire and Bristol. Ed Valentine dual trained in Emergency Medicine and ICM in Wales before undertaking a Pre-Hospital Care Fellowship with London HEMS. Currently Ed is a Consultant in Emergency Medicine at the Royal Gwent Hospital in Newport, an HEMS Consultant with the Great Western Air Ambulance, the Air Base lead doctor for the Wiltshire Air Ambulance and an active BASICS doctor working for SWIFT Medics.